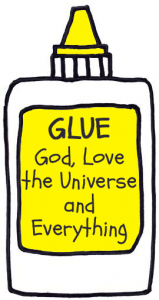 GLUE is a short, 5-week course that explores something theologians call the Grand Meta-narrative. This is a posh way of saying the Overarching Story or The Big Picture. GLUE will give you an overview of how the Jewish community, Jesus, The Holy Spirit and Church fits into the story of God and the world. GLUE can be used as a starting place for people who work with Christian churches, for example teachers and staff, to help them understand the basics of Christianity – i.e. how it all sticks together. For example, GLUE helps place acts of collective worship on biblical themes into a wider context. GLUE can be run over breakfast, in a lunch-hour or in a small group at work or at home. Either way it should always involve lovely food and drink – e.g. pastries and fresh coffee. What is the content of GLUE? How long does GLUE last? A GLUE session can be as short as 30 minutes or as long as an hour but 45 minutes is probably about right. It is important to give time for discussion and questions. How has GLUE been used? GLUE was written and developed to be used with a local CofE primary school – with the teachers, teaching assistants and support staff. We ran the course over 5 consecutive weeks for 30 mins before school started with fresh coffee and yummy pastries. The talks from GLUE were also broadcast as seven Pause for Thoughts on BBC Radio Devon in 2012.